The Boerboel is a large mastiff breed, the nearest related breed is probably the Bullmastiff , at least that is the breed who comes closest in appearance. 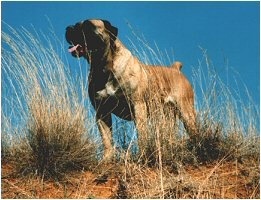 Boerboel is unike in temperament as this is the only dog in the world that is breed solitary to guard and protect. All other protective breeds are either working or herding dog to begin with. The Breed began in south afrika as the white farmers farm dogs, it was made out of different dog breeds, coming with the settlers in the early 1600th century. These Colonists came from central Europe and brought with them the biggest and strongest dogs from that time, the same dogs who had been used as war dogs, bullfighting dogs and guarding dogs. The Boerboel has been forced to be strong and purposeful at farms ,way out of civilisation ,where there is no space for weakness or troubled mentality. These dogs had and still have to function without problems for their handlers, a difficult dog may cost ones live when facing the dangers of wildlife or the major criminality in that part of the world. If you are thinking of getting your self a Boerboel, you need to make up your mind about what it exactly is you expect from a dog in your life, a boerboel is not a dog suit for everyone! The breed is a extreme protective kind of dog, it is also very territorial and reserved ,it is not the kind of dog you chose for agility work or as a social companion to follow you around the hood friday night, it is designed to stay at home and protect your property and family. Dont chose a boerboel because you think it looks cool and would fit your image ,it is not a toy ,it is made to stop any treat its owner may meet, and that is what it does.